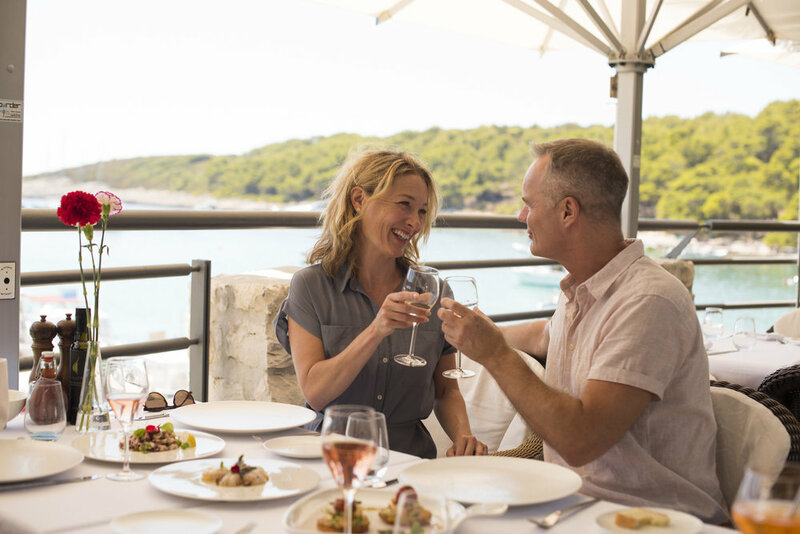 Situated on a magical island of St Klement, near Hvar town, restaurant Zori has 60 years of tradition in creating great food and delivering exceptional guest experience. "Eating good food, drinking good wine in good company is one of life's most civilized pleasures." Adriatic is well known for its quality fish and seafood in general. Interested in catch of the day or more for scampi or dalmatian specialties? We have it all. Paired with quality wine the feast is guaranteed. Developed by a oenologist our wine list offers some of the best Croatian as well as international wines, from smooth and elegant to rounded and rich. We are proud to offer high quality Champagnes from small, independent, family run wineries from the Champagne region in France. Whether celebrating a special occasion or just being a Champagne lover our selection will surely please. Why fly when you can float? Restaurant Zori is situated on St Klement island, 10 minutes of boat drive from city of Hvar and 5 minutes of walk from ACI Marina Palmizana, one of the safest marinas on the Adriatic. If you are in Hvar then you can arrive by booking a taxi boat that will take you directly to our restaurant. If you are arriving by boat, sail boat or yacht then you can book your place at the ACI MARINA PALMIZANA, or anchor in the bay of Vinogradisce, directly in front of the restaurant. Book your table by clicking the BOOK NOW button.